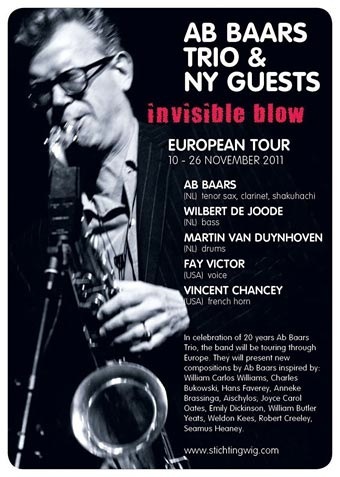 In celebration of 20 years of Ab Baars Trio, the band will be touring through Europe with Invisible Blow. Emily Dickinson, William Butler Yeats, Weldon Kees, Robert Creeley and Seamus Heaney. The theme of Invisible Blow is inspired on boxing as a metaphor for life. The focal point is on growing older and the inevitable confrontation with the invisible blows of life. Ab Baars will compose the program titled Invisible Blow together with Dutch poet Anneke Brassinga. The Ab Baars Trio has been together since 1990. All three have long and varied musical histories that encompass both the world of jazz and many points on the musical spectrum beyond, working with everyone from pianist Cecil Taylor and guitarist-composer Fred Frith to fellow Dutch avant punks the Ex. While a connection between these ventures seems negligible, there is a strong common denominator throughout; the commitment to improvisation. With this emphasis and the endless possibilities it yields, it's not surprising that Baars views music as an idiom beyond the reaches of neat-fitting names. Baars met Fay Victor when she played with the ICP Orchestra during a recent tour. Apart from her own groups she has been working with musicians like Roswell Rudd, Anthony Braxton, Misha Mengelberg, Gary Lucas en Steve Coleman. Baars met Vincent Chancey in 1994 while working in Guus Janssen's opera Noach. Besides his own Phat Chance Quartet, he performs with Dave Douglas' Brass Ecstasy and the Sun Ra Orchestra. He also used to work with Charlie Haden's Liberation Orchestra, Lester Bowie's Brass Fantasy and Carla Bley. This anniversary CD-box set will be released in a limited edition during the Invisible Blow tour. 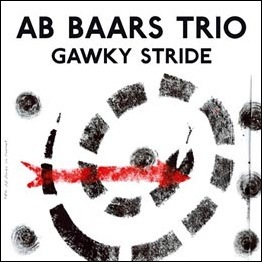 It contains a selection of CD- releases by the Ab Baars Trio over the past twenty years, plus the CD ‘Gawky Stride’ with new compositions by Ab Baars. 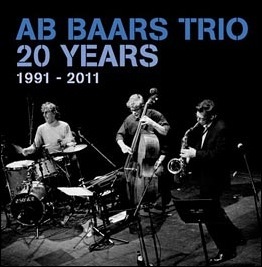 The CD-Box set also contains an additional booklet 'Ab Baars Trio 20 years (and Counting)' by Kevin Whitehead. This booklet with essay by Kevin Whitehead, photo’s, discography and chronology is also separately available. Ter gelegenheid van hun twintig-jarig bestaan, gaan het Ab Baars Trio in november samen met New-Yorkse gastmusici Vincent Chancey en Fay Victor met Invisible Blow op tournee door Nederland en Europa. Invisible Blow is een term uit de bokssport en kan worden opgevat als een metafoor voor het leven. Het programma is samengesteld door Ab Baars i.s.m. dichter Anneke Brassinga. Inspiratiebron voor de muziek zijn gedichten en teksten van William Carlos Williams, Charles Bukowski, Hans Faverey, Anneke Brassinga, Aischylos, Joyce Carol Oates, Emily Dickinson, William Butler Yeats, Weldon Kees, Robert Creeley, Seamus Heaney.